Happy Saturday! 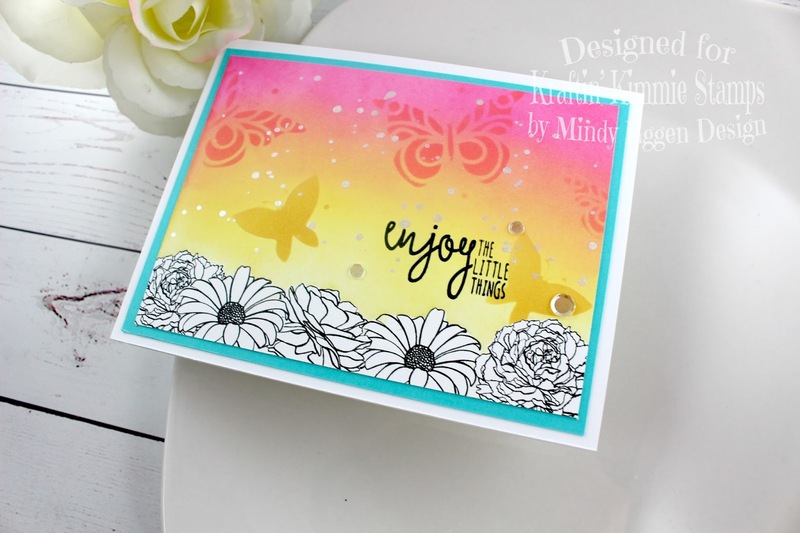 Today starts another challenge with Kraftin Kimmie Stamps and it’s SPRING!!! Oh how I wish it was Spring. We just got dumped on with more snow. I don’t know about you but I’m done with snow. I really enjoyed myself while creating this card and these colors warm me right up. I will also have a video for you but unfortunately I did not get the voiceover done yet so be sure to check back to my blog or subscribe to my youtube channel to be notified when I get it up. So for today’s card I’m using the stamp set Fancy Florals. I created a couple masks for each flower using masking paper. I stamped one image, added my mask and stamped the next flower. I repeated this process until the entire bottom of the card was filled with flowers. Next I’m going to work on my ink blending. I’m using Squeezed Lemonade and Picked Raspberry Distress Oxide Ink. Then I am going to lay the stencil over parts of the card and add some butterflies. I used Fossilized Amber and Abandoned Coral for the butterflies, randomly adding them throughout the card. I spritzed some water on my craft mat and added some perfect pearls to the mix. Then using a paint brush to pick up the mix, I sprinkled this across my card for some shimmer. Once my background is done, I removed the masks. I actually intended on coloring the flowers but once I removed the masks, I really liked how white they were with the colorful background. So I left them! I layered my panel onto some Turquoise Sea cardstock and added this to an A2 size cardbase. Using my Misti stamping tool, I added the sentiment with Versafine Ink. To finish off the card, I added a few Sparkling Clear discs with Nuvo Deluxe Adhesive. I hope this put you in the Spring mood! I absolutely love all the warm colors! Submit your SPRINGY design for your chance to WIN! You have until Friday, April 13th to enter this challenge! Keep in mind, all entries are welcome but you must use a Kraftin’ Kimmie Stamp in order to win. Be sure to hop on over to the Krafty Shop this weekend because our FRUGAL FRIDAY SPECIALS are up with FOUR of our amazing stamp sets on 40% OFF! Plus our Inspirational Wednesday featured set is on SALE as well! Can’t wait to see your krafty kreations!! Happy stampin’!